Happy almost Thanksgiving to my U.S. based readers! What do you have planned for the holiday? 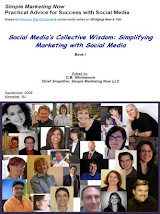 In case you have time for some reading, here are ideas for you based on what I've published on the Simple Marketing Now website. On Content Talks Business Blog, you'll find several blog articles having to do with 'getting started' a topic I'm getting more and more questions and comments about. If you can remember back to when you were new to blogs and social media, what did you find most helpful for exploring and getting immersed? On the Social Flooring Index Blog, the November 2011 update is done. However, there' more relating to flooring and social media! I welcome your comments and wish you and your family a wonderful Thanksgiving!